On the beautiful summer afternoon of Tuesday, July 31, the rider of a Harley-Davidson "Softail" motorcycle – "road-dressed" with saddlebags – was breezing northbound on S.E. Milwaukie Avenue, just before 3 p.m. The driver of an SUV was pulling up to Milwaukie westbound on Knight Street, and stopped at the intersection. 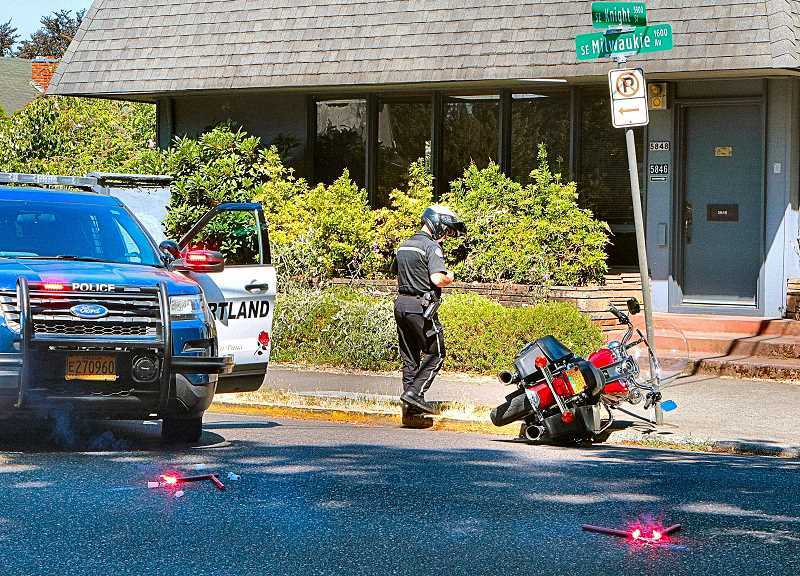 But – according to police – she said her vision had been obscured by a vehicle parked close to the intersection, so she started to pull across Milwaukie and then saw the oncoming motorcycle, and stopped abruptly. The biker, perhaps startled by the sight of a vehicle partway into the intersection ahead of him, also attempted to stop quickly – but, instead, he laid the bike on its side and slid about 40 feet to a stop at the northeast corner of the intersection. "No vehicles made contact during the incident," assured a Portland Police Bureau Traffic Division officer at the scene – who told THE BEE that, after a preliminary investigation, no citation would be issued. The motorcyclist was transported to a local hospital for medical evaluation. "He was wearing a helmet," hopefully pointed out the officer. Due to recent new federal medical privacy laws, there is no further information on the rider's condition. S.E. Milwaukie Avenue was closed to traffic for an hour after the mishap, with vehicles detoured around on side streets until the investigation was complete.